Note: to view the full-scale image, right-click on the reduced picture, and choose "view image"
Maria Jesus Agreda (1602 - 1665) - the only member of our gallery who is not represented by a painting but by a ... photograph. This is SHE in the 1990's in her coffin! 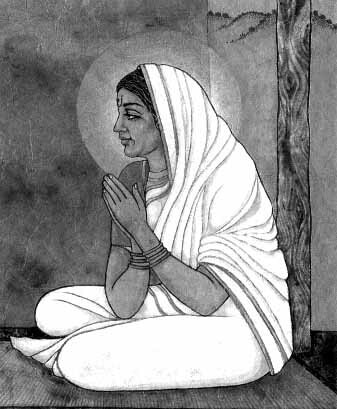 She was a nun and a mystic, an author of several religious writings. But she is most famous because of the legend about the "Blue Nun", who, it is said, converted many native Indians in present-day Texas to Christianity (though she was in Spain at that time). She had problems with the Inquisition because of this fact. Perhaps this is why a cheap bottle of Blue Nun wine tastes so bad? Duchesse d'Aiguillon (Marie-Madeleine de Vignerod, Mme de Combalet) (1604 -1675) - niece of Richelieu. She was the first to defend le Cid of Corneille. Mistress of a Parisian salon. Anne of Austria Anne of Austria, queen of France (early 1640-ies, from a biography of Louis XIV). The painting was shown in an exposition at the Kunsthistorisches Museum/Vienna only a few years ago. portrait she is still a young German princess. Julie d'Argennes, daughter of Catherine de Vivonne, Marquise de Rambouillet (see picture). Julie was a "muse" to many poets. We should definitely re-visit the system of "musemanship", who needs sponsors if we can have muses? God is present in the midst of wordly life. Elizabeth Barry. Born 1658, this remarkable actress excelled in the tragic technique of harmonizing expressions, tones of voice, and emotions. She was not pretty as shown on the picture (!) but her acting was so superb that spectators forgot her looks. She never got married and left no relatives. Madame de Saint-Baslemont de Neuville. Famous woman warrior who actively defended her manor in 1634 during the Thirty Year War (www.grandsiecle.de) A commemorative portrait of her was painted in 1638-1640 showing the valiant lady wearing the white scarf of the commanding officers of the French crown. Mary Beale. English Painter. It was very unusual for a woman to take up a professional career as an artist at this time, but Mary Beale soon built up a considerable clientele, especially among the new breed of leading Puritans. Indeed, she became so successful that her husband chose to abandon his own career in order to act as her assistant and secretary! 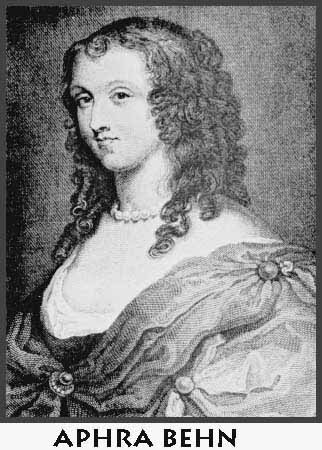 Aphra Behn (nee Johnson). The first professional woman writer in English, 1640 (Canterbury) - 1689 (buried in Westminster Abbey). With a father specializing in barbering and an illiterate mother, Aphra Behn beat incredible odds to become the most extraordinary women writer of her time. She would become the first female author to write impressively for the development of prose fiction and compose some of the most acclaimed political poetry of the period. The "mother of the English Novel" also authored the first English anti-slavery novel "Oroonoko" and also the first English epistolary novel "Love Letters between a Nobleman and his Sister" In her own words, she lived a "life dedicated to pleasure and poetry". Aphra was very flirtatious with her sexuality, mainly, but not exclusively, towards women. Ebba Brahe, famous Swedish femme fatale, who eventually got married to the lucky Generalf�ltherren Magnus Jacob De la Gardie. This led to a grand total of 14 children! St. Marguerite Bourgeoys (1620-1700) was canonized on October 31, 1982 by Pope John-Paul II. Following her arrival in Montreal in 1653 she devoted herself to a life of teaching. She founded a community of nuns called the Congregation of Notre-Dame of Montreal. She is shown here in a painting by Dubois teaching natives and children of colonists. 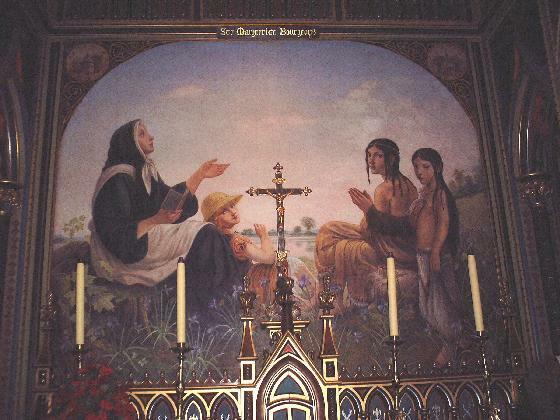 This painting can be seen in Montreal's Basilica. Anne Bradstreet. Her contribution to literature and poetry was paralleled only by her devotion to her faith (puritanism) and her family (she had 8 children). The willingness to journey to a strange land (she came to Massachusetts from England in July 22, 1630) was mirrored by a desire to explore the soul in all its aspects. Isabella Brant. P.P. 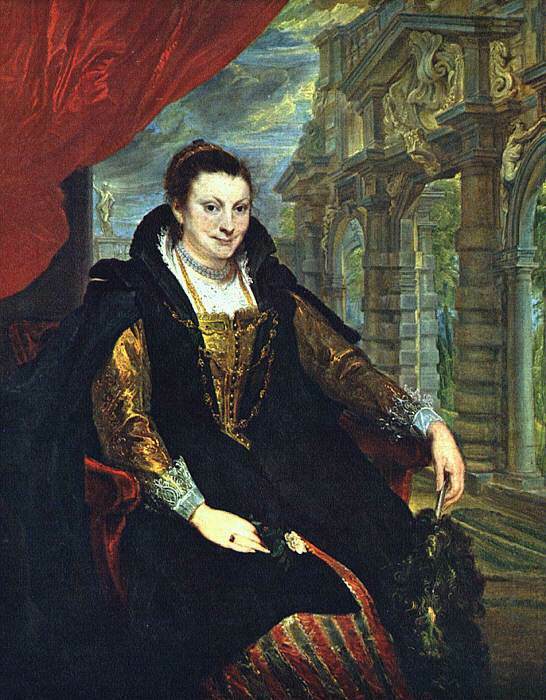 Rubens' wife. Painted by, you guessed, Rubens himself. Francesca Caccini- ("La Cecchina" - "The Songbird") (1587 - 1640?) - the daughter of the famous composer Guilio Caccini, the singer, poet and composer herself, the first female composer of opera (La liberazione di Ruggiero dall'isola d'Alcina). She was praised by Monteverdi. 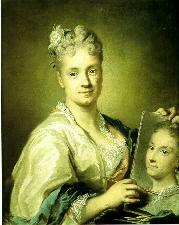 Rosalba Carriera - self-portrait of the famous artist, member of several artistic Academies. She is generally associated with the XVIII'th century, but she was born in 1675. 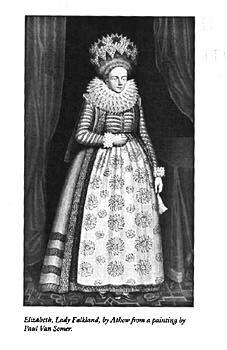 Elizabeth Cary - the author of the first published tragedy by a woman in the English language, "Tragedie of Mariam". Donna Catalina de Erauso. Basque woman warrior who left a nunnery in 1596 and travelled to Peru where she became a soldier of fortune. She used sword, knife, and pistol, and fought in battles and in duels. She died around 1650. A book was recently written about her life story, entitled "Lieutenant Nun: Memoir of a Basque Transvestite in the New World". More details can also be found in a final Project for English 341--American Lit. 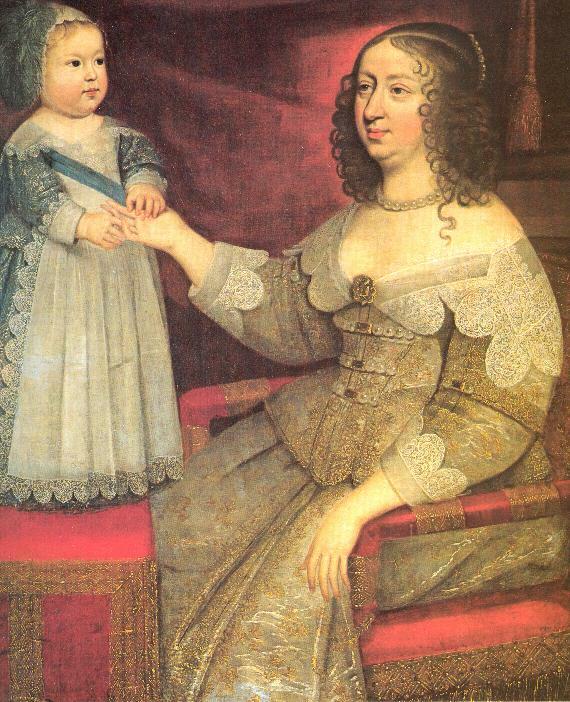 to 1865: Gender and Sexuality, by Megan Barrett, 11 May 1998, entitled: " Performative Gender in The Coquette and The Female Marine"
Catherine of Braganza -- queen of England, wife to Charles II, Portuguese by descent. Despite her Catholic roots, she was respected and admired by English people. However, she was childless, and so Charles only had illegitimate children. 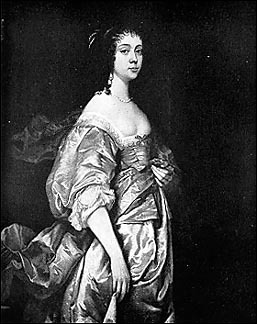 Margaret Cavendish. English writer, poet and original philosopher. For a very interesting essay on this famous woman, see www.chat.ru/~violtrof/indexe.htm. Jeanne de Chantal, a friend and a spiritual student of Saint Francis de Sales. In 1610 she founded the Order of the Visitation of Our Lady, which still exists. Lady Anne Clifford, famous diarist, �Sheriff of Northhumberland�. Henriette de Coligny, Comtesse de la Suze (1618 - 1673). Poetess, author of elegies, mistress of a salon. I have no idea if she is related to the famous French aperitif "Suze" -- this would certainly explain the countess's facial expression. Elena Lucrezia Cornaro Piscopia ("Cornaro"), first woman to obtain a doctorate at a university (Padua). Her doctorate was in philosophy, but she was an excellent mathematician, astronomer, biologist. She spoke several languages and performed 4 musical instruments. She was extremely gifted in about anything she did. Many claim she would have been ranked higher than Newton, Galileo, Keppler and Copernicus, had she not suffered from the handicap of being ... female. 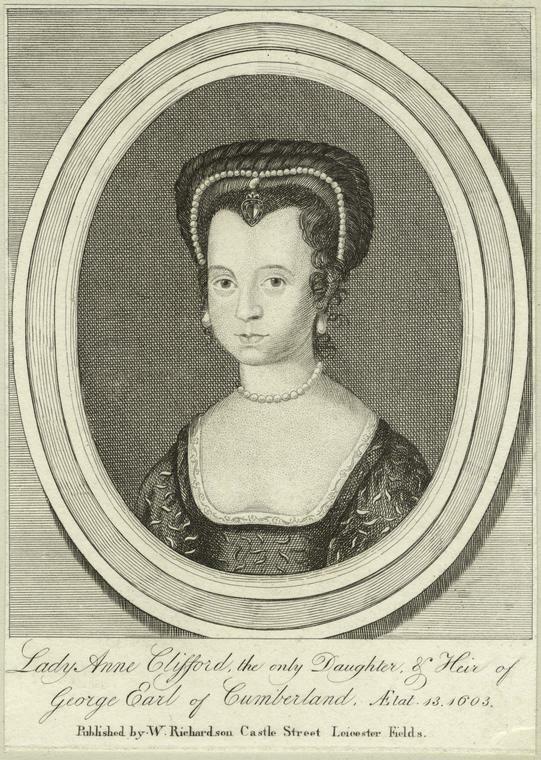 Joanna Ines De La Cruz (Sister). Reportedly, the greatest poet the American continent produced in the seventeenth century. She was born November 12, 1651, in San Miguel Nepantla, a village south of Mexico City. She was a Poet Nun, a woman of genius, and a person of intellectual prowess whose ideas and accomplishments were ahead of her time. Moll Davis. 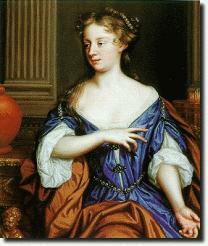 Mistress of King Charles II of England (see also Frances Stewart, Barbara Villiers, Lucy Walter). Actress and mother of one of the King's children. Mary Dyer, the American Quaker Martyr. Hanged in 1660. Mary Dyer was a gentlewoman by birth and a rebel by trade. The wife of a London milliner, she could have spent her life as a dutiful Puritan, reading the Scriptures with other cossetted women of her class. Instead, she went willingly to her death, a martyr to the cause of Quakerism and religious freedom. On the day of her execution, the crowd was so great that the bridge between Boston and the North End broke. Dyer was led to the gallows, a giant elm on the Boston Common. Her arms were bound, her skirts tied around her ankles and her face covered with a handkerchief. She was made to watch while her companions were executed. The rope was placed around her neck. She ascended the ladder. Only then was she told that she would not die. Her reprieve carried a price: She could never return to Massachusetts. Once again Dyer was hustled off to Rhode Island, where she could have practiced her faith in the safety and comfort of her family and friends. But she returned to Boston a few months later. Again she was arrested and sentenced to die. Again she was given a chance to save herself on the gallows. And once again she refused. "Nay, I cannot," she told the crowd. "For in obedience to the will of the Lord, I came. And in His will, I abide, faithful to the death." She was hanged June 1, 1660. The next day she was buried in an unmarked grave on the Boston Common. After her execution, a Puritan said scornfully, "She did hang as a flag for others to take example by." He was right. The king of England then banned all further executions of Quakers in Boston. Elizabeth of Bohemia, the Elder -- the daughter of the English king James I. Nicknamed the "Winter queen" (her husband was the king of Bohemia only for one winter in 1619). She was famous for her beauty and grace, but also for her daughters Elizabeth, who became the patron and friend of Descartes, and Sophie (see Sophie of the Palatine) who was the patron of Leibniz. An ideal combination of beauty and science! 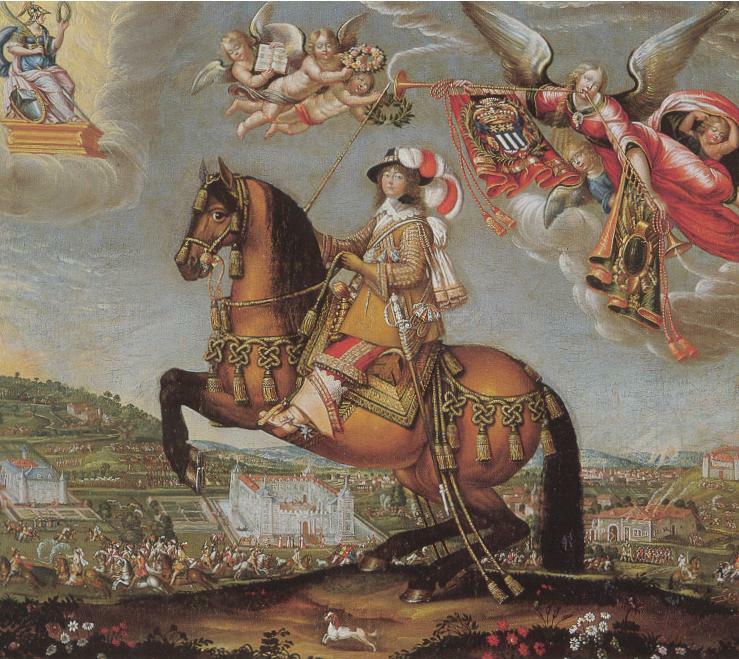 Elizabeth of Bohemia, the younger (1618-1680). Daughter of the "Winter Queen", she was one of the most educated women of her time, Descartes' friend and correspondent (as well as Cristine of Sween), at the end of her life an abbess of a Protestant(!) convent at Herford in Westphalia, which offered refuge to religious dissenters like Anna-Maria van Schurman, WIlliam Penn and others. This is a portrait by W. van Honthorst (1640), showing her as a Diana. Dorothe Engelbretsdatter, probably the first Norwegian poetess.